Curry, or more specifically kare-raisu (curry rice) has a long tradition in Japan, but it really took off after 1931 when Crosse & Blackwell (a British company) began marketing ‘curry rice mix’ to Japanese urban sophisticates. 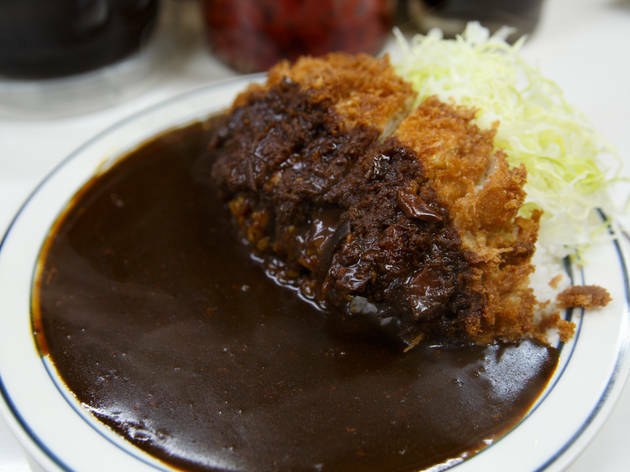 This ‘curry’ caught on, and morphed into an everyday staple that is sometimes – as here – served accompanying the breaded and deep-fried pork staple, tonkatsu. Kitchen Nankai is an exemplar of its type, specialising in this triple-whammy of warming comfort food, plus a few variants on it. Rock up to the entrance, and if there’s a queue (likely at peak times), one of the chefs will come out and take your order while you stand in line. If you’re not sure what to order, simply point to the dish immortalised as a plastic replica in the window display. You pay at the same time and get a coloured plastic token which you give to your waitress once seated. 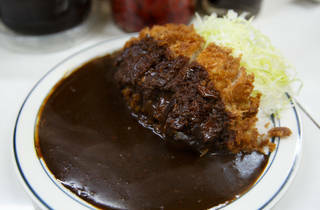 The most popular combo of rice, curry and tonkatsu costs a mere 700 yen. If you prefer chopsticks to the perfunctory metal spoon provided, simply ask for hashi. You can help yourself to the red pickles known as fukujinzuke. Portions are large here; tables shared and cosy. Afterwards, walk off the calories with a stroll through Jinbocho’s sprawling book district.